Below are common attributes associated to Pineapple Guava. Become a care taker for Pineapple Guava! Below are member comments regarding how to plant Pineapple Guava. No comments have been posted regarding how to plant Pineapple Guava. Be the first! Do you know how to plant Pineapple Guava? Below are member comments regarding how to prune Pineapple Guava. No comments have been posted regarding how to prune Pineapple Guava. Be the first! Do you know how to prune Pineapple Guava? Below are member comments regarding how to fertilize Pineapple Guava. No comments have been posted regarding how to fertilize Pineapple Guava. Be the first! Do you know how to fertlize and water Pineapple Guava? Below are member comments regarding how to deal with Pineapple Guava's pests and problems. No comments have been posted regarding how to deal with Pineapple Guava's pests and problems. Be the first! Do you know how to deal with pests and problems with Pineapple Guava? Get Pineapple Guava fresh and large directly from the grower to your garden! Buy Pineapple Guava online from the nursery wholesalers and save BIG! To protect the fruit from sunburn and other adverse effects of high temperature, choose a planting site away from hot, reflected sun. Pineapple Guava can tolerate partial shade and slight exposure to salt spray. They also make an excellent foundation plant, either singly or as an informal hedge. They will grow in a wide variety of soils. The best harvests, however, come from plants growing in well-drained soil with a pH between 5.5 and 7.0. They are fairly salt tolerant, but salinity slows growth and reduces yields. Pruning is not required to keep Pineapple Guava productive, but a light pruning in the summer after fruit is harvested will encourage new growth and increase yields the following year. Thinning the plant also permits easier harvesting. 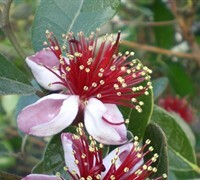 When grown as a hedge, Pineapple Guava responds well to heavy pruning or shearing, but this reduces flower and fruit production. The flower of this guava is not only beautiful but edible. The white pedals have a sweet somewhat fruity tast. Add the pedals to a green salad or a bowl of fruit. You may have to work fast to collect the flower pedals as the birds love these pedals also. Wondering when the guava fruit is ripe and ready to pick? You don't have to pick it, just pick it up. Most of the fruit will drop when it is ripe and at its fullest flavor. If you are afraid of them bruising by dropping you can pick them, but only if they release from the tree easily. If not wait a few more days and try again. Pineapple Guava is remarkably pest and disease-resistant. It is occasionally attacked by by black scale in California, as well as fruit flies where that is a problem. Pineapple Guava grow slowly and require only light applications of a complete, well-balanced fertilizer such as 8-8-8. fertilizer. A light application once every two months can speed growth.